These days we all have a camera in our pocket. Most of the time we carry a smart phone. Increasingly we use our phones to make notes for later. It’s very easy to take a photo of text in a museum or take photos of something we see out and about, to act later as memory joggers. It’s not necessarily anything to do with the art of photography. It’s memory extension, brain augmentation. We can consistently capture detail and colour more accurately than our brain can render from memory. This is useful for identifying unfamiliar trees or plants you see. When you get home you can open up a plant ID book or start to look online. With some plants, you only need to capture one key feature or to capture the general character of the species to be able to single it out. With others, you really need to capture more. With the carrot family, this is certainly the case. The carrot family, Apiaceae, is in some ways notorious. This family contains poisonous species such as hemlock, Conium maculatum, hemlock water-dropwort, Oenanthe crocata, cowbane, Cicuta virosa, fool’s parsley, Aethusa cynapium, and rough chervil, Chaerophyllum temulentum, not to mention the skin-blistering giant hogweed, Heracleum mantegazzianum. The carrot family – previously known as the Umbelliferae and still often referred to as the umbellifers – contains many species cultivated for food and found in your local food store. Examples include carrots, parsnips, celery, celeriac, fennel, flat leaf parsley, coriander, dill, caraway and cumin. 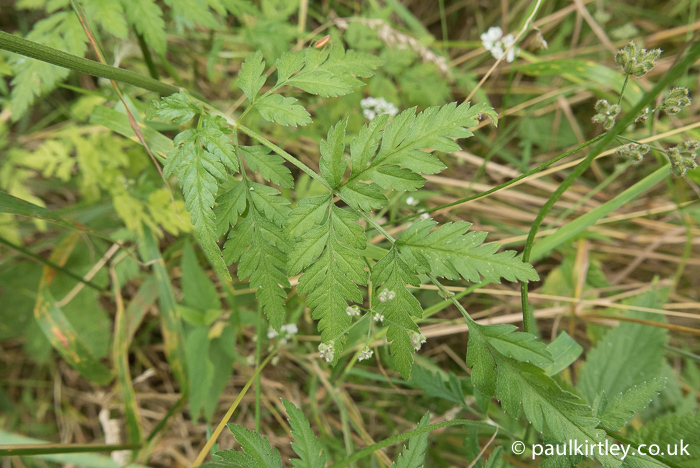 The family also contains wild edibles such as pignut, Conopodium majus, wild carrot, Daucus carota, wild fennel, Foeniculum vulgare, wild angelica, Angelica sylvestris, hogweed, Heracleum sphondylium, sweet cicely, Myrrhis odorata, alexanders, Smyrnium olustratum, scots lovage, Ligusticum scoticum and cow parsley, Anthriscus sylvestris to name but a few. 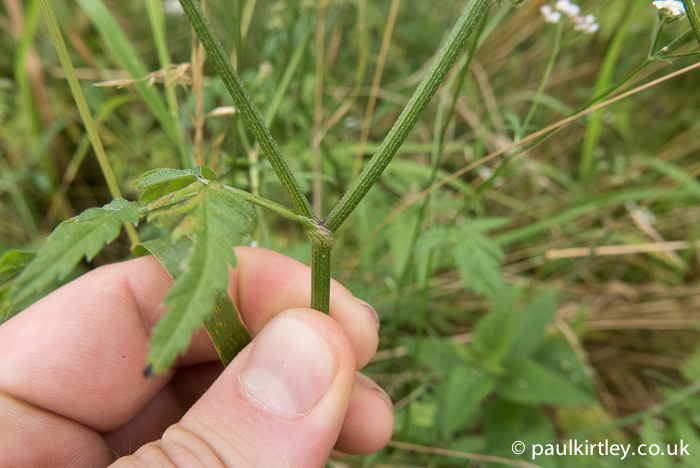 As mentioned in a previous article on this site, "What makes the Apiaceae particularly tricky is that the edible species often share many similarities with their highly poisonous relatives, notably white flowers clustered into umbels, pinnately divided leaf structures and tapered, tuberous roots typified by parsnips." So what details should be considered so you stand a chance of identifying the species? 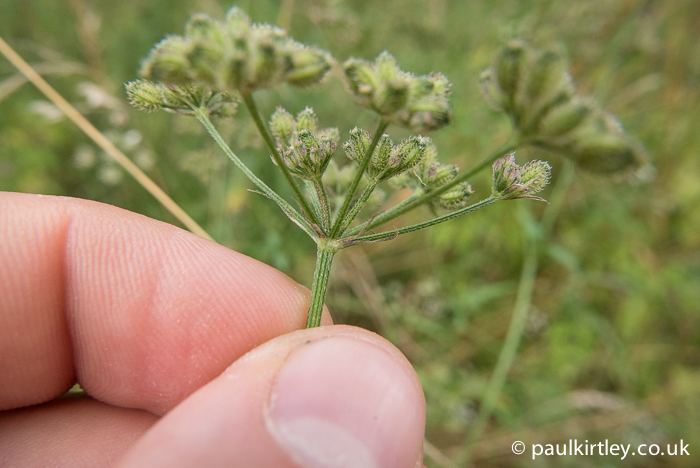 While you don’t need a photograph for every single question or observation below, these are the details you are going to have to capture or record in order to identify Apiaceae species and which will be detailed in any good ID guide. These are the questions you should be asking and the facts you should be recording. Many of them can be captured in a single photograph. In what type of habitat is the plant growing? Woods, wayside, field margin, river bank? Shaded or in full sun? Wet or dry ground? In water? How tall is the plant? Does it have a distinctive smell when crushed? 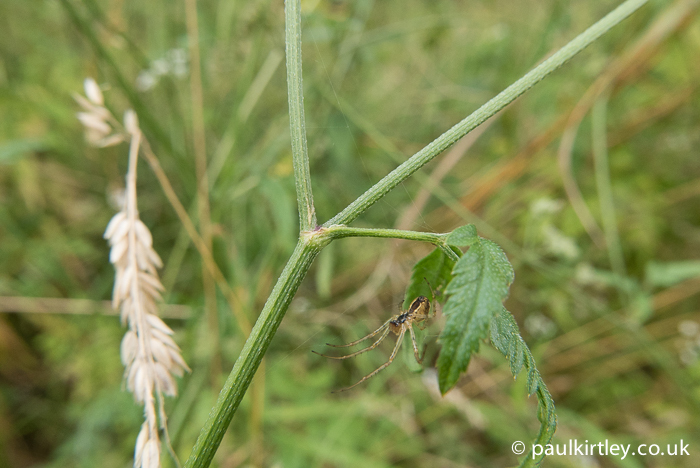 Is the main stem thin and spindly or broad and robust looking? Is the stem ridged or smooth? Is the stem hairy or smooth? Does the stem have a noticeable white/bluey-white bloom, which is easily rubbed off? How would you describe the hairs? Is the stem hollow or solid? (NB take care as you’ll need to cut/break the stem to determine this and some have irritant sap). Is the stem purple or does it have have purple blotches? Are the nodes where the stem splits into two swollen at all? Are there different size or shape leaves at the base of the stem to leaves part way up the stem? What shade of green are the leaves? Are the leaves a different shade on top to underneath? Are the leaves solid or divided/subdivided? 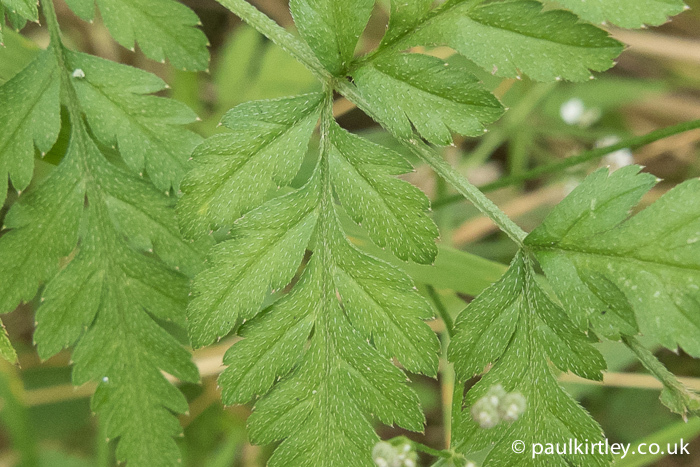 If the leaves are divided, do they look like flat-leaved parsley or coriander? Do the leaves look frilly or lacy? Do the leaves have teeth or serrations on their margins? Are the leaves hairy on top? Are the leaves hairy underneath? Are the leaves shiny or matt? What’s the overall shape of the leaves? Triangluar? Lance-shaped? Are there sheaths at the base of the leaf stems? Members of the family Apiaceae typically have flowers grouped together into umbels, the structure of which is formed by flower stalks, also referred to as rays, of roughly equal length, emanating from the top of a stalk or stem. These point out in different, broadly upwards, directions like the ribs of an umbrella to form the flower head or, inflorescence. While this type of inflorescence is characteristic of the majority of the family, there a differences which allow identification. Is the umbel at the top of a stem or opposite a leaf? How many rays are there? Is there a gap between one cluster of flowers at the end of a ray and the next or are they all matted together? What’s the overall impression of the colour of the flowers? Yellow? Pure white? Creamy? White with a pinkish tinge? Are any individual flowers a different colour to the rest (for example purple as opposed to mostly white). How would you describe the overall character of the flower head? Flat? Rounded? Hemispherical? If there are seeds visible, are they…. Elongated, like a grain of rice? All of the above features lead to an identification of the plant as Torillis japonica, commonly known as upright hedge-parsley. 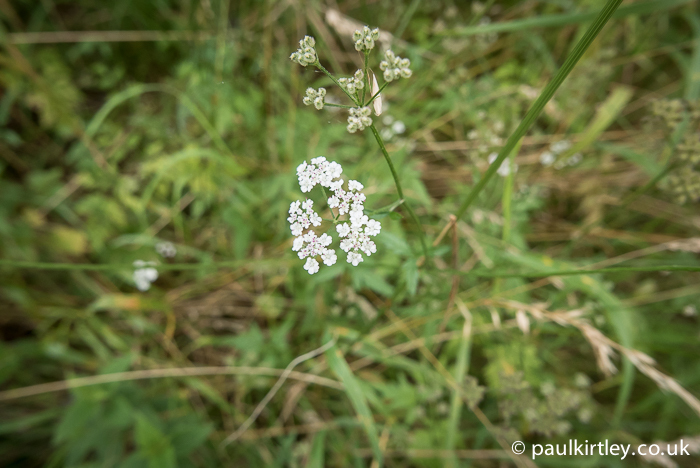 This species is really quite common, one of the most common white-flowering roadside umbellifers in the UK. Yet many people have never heard of it. 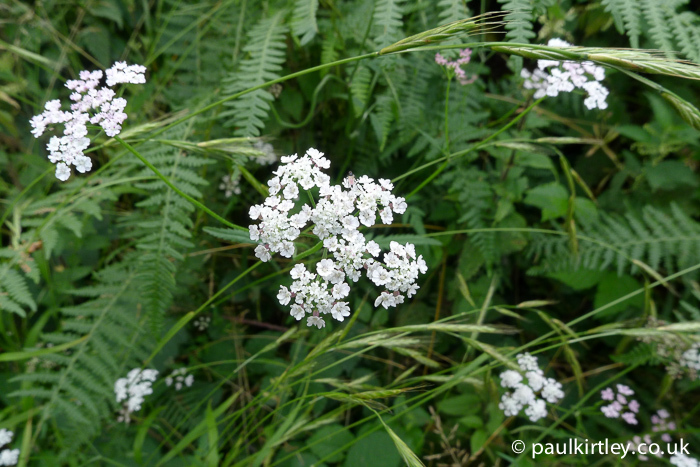 I get the impression many lump it together with cow parsley, Anthriscus sylvestris, in their minds, even though they flower at different times of the year. Yes, stick to what you know and look to expand you knowledge as you go. A good approach. 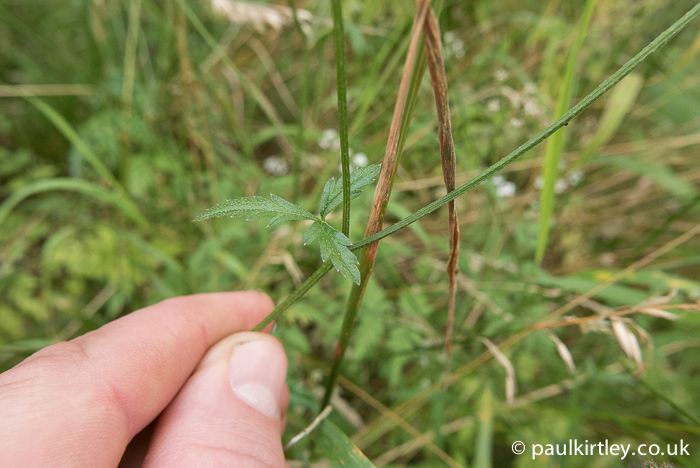 I’m just starting to identify this family, and with its early appearance thought I had cow parsley nailed along with hogweed, but now will take a closer look incase I am missing anything obvious. My main confirmation has been shape 9of seed pods. Thanks for the added details. Glad you hear you are taking a methodical approach – always the best way. And, yes the fruits/seeds are usually highly diagnostic. Great article Paul, I love reading them and making notes as I go through for reference when I’m in the field. Wild carrots or queen anne’s lace are the ones I’m most familiar with and will harvest. It’s good to hear from you. I’m glad you get a lot out of these articles. Thanks Paul ! Any time! For me it is not too late. Very impressive article. All the best. Thanks Paul, such a diverse family, with some edible and others definitely not. I am grateful for the tip about taking a photo and looking up at home before eating any. Using my phone to compare to Google images of the Apiaceae family members is a good tool. Keep up the good work and keep safe, Dave. Glad you liked this Dave. 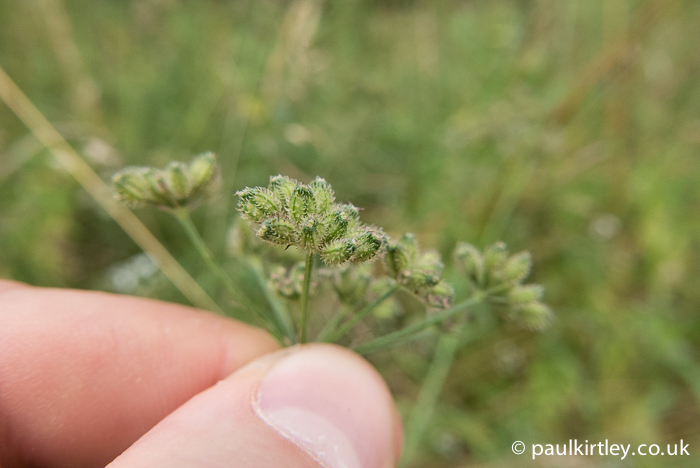 You do have to be careful with the Apiaceae but the good thing is there is a lot of diversity – the more you study the family, the more you can tell them apart. You just have to be honest with yourself and not make things fit. We have a lot of tools at our disposal now to accelerate our learning too. 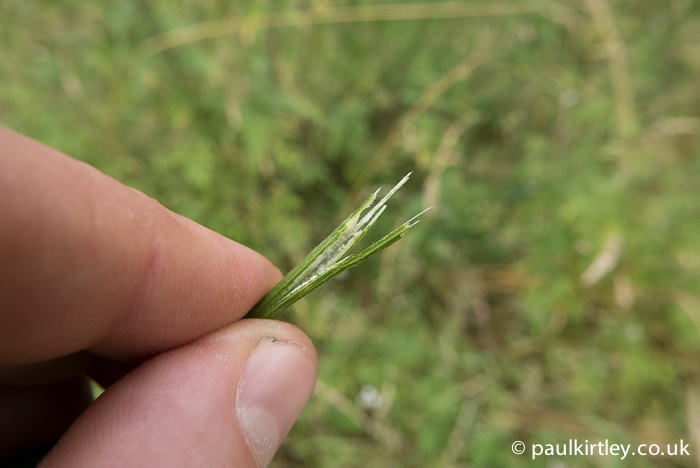 Just a note of caution on plant ID using Google images, though; there are quite a lot of pictures out there on the internet which are mislabelled. Noone is responsible for checking that what comes up on a Google search for a particular species only shows photos of that species. They are more likely to be correct if you search on the scientific name than using a common name but even so, cross reference with books. Take care and keep enjoying nature. Seeing Identification done properly like this actually puts me off taking it further as I realise the effort required, the risks involved and what a specialism it is. Which is a shame. It also makes me wonder how I’m still alive! Wow. I was never particularly bothered about identifying this family, but I will be now. I should qualify that statement by saying that I wasn’t randomly scoffing all carrot like plants, I just thought that parsleys were easy to spot and safe. Now at least I know better for the future. Thanks for your comments. I’m happy this has added some additional dimensions to your view of the carrots/parsleys. Hi there, great article and website. I have been doing the same 2 mile walk almost daily (wayside, woodland, river bank and arable field edges) for the last 3 years and record all the wildflowers I can identify and the rough date they first appear in flower. But I have always given the carrot family a wide berth as I am so scared of the hemlocks and hogweeds! I think I know what alexanders, cow parsley (or is it?! ), ground elder, giant hogweed and Queen Anne Lace look like but I would love to learn about all the others…will keep trying and use the very useful information on this site to guide me. Many thanks and best wishes, Maria. Thanks for your comments Maria. I hope the above article is useful in your regular walk.